The Coast Guard held a routine inspection at the Range Light on Wednesday morning. 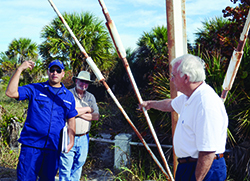 This is one of the final inspections before the turnover, meaning that the Barrier Island Park Society will receive a licensing agreement to restore and operate the newly named Range Light to the Gasparilla Light. The turnover is planned to happen during the last week of February 2016. Shown above are Jon Genvenuto, retired engineer Sam Castronova and architectural metal expert Alex Klahm at the Range Light. “This has been a 12-year process, wrestling this from the Department of Defense, then Homeland Security, then the Department of Interior and finally the U.S. Coast Guard. The Coast Guard will still have the right to maintain the light atop the GIL, as it will continue to be used for navigation,” said Larry Hannah of BIPS. Hannah said he and others from BIPS will be meeting with the Coast Guard in the future to finalize the details of the turnover.